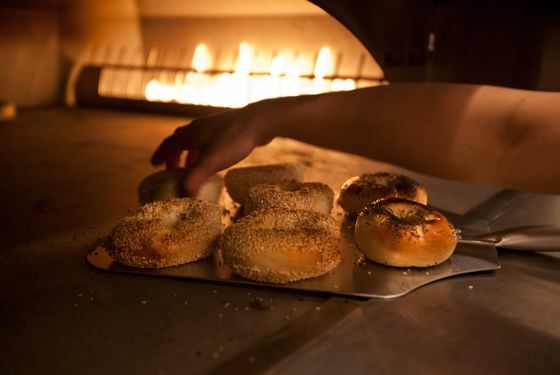 As you have probably heard, there is a new bagel purveyor in town — Black Seed — and its offerings are very, very popular. 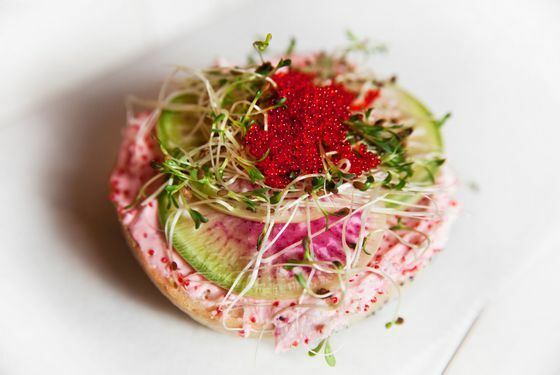 It’s not surprising: The bagels are also quite good — smaller, lighter, and less chewy than the carb bombs you find in a deli counter, an ideal medium with which to transfer the shop’s homemade cream cheese and beet-cured lox. 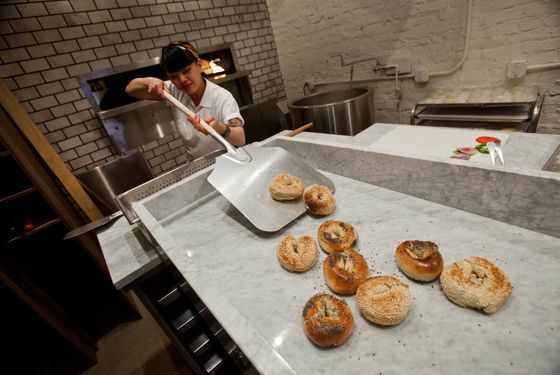 So, just how are the bagels made? Good question. 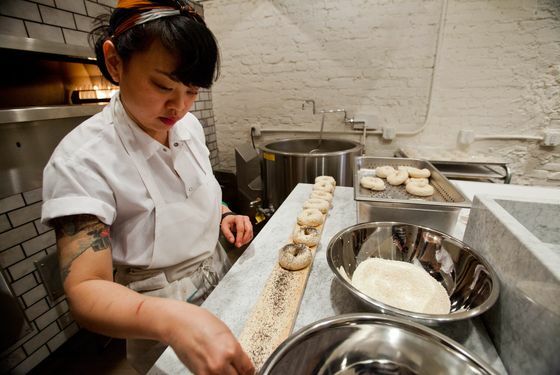 We recruited Black Seed’s head baker, Dianna Daoheung — who has been arriving at the bakery at 3 a.m. to get ready for the crowds — to show us exactly how the main attraction comes together. The yeast-raised dough, which contains honey for sweetness, sits for 24 hours. It gets a boost from the addition of some older dough that’s mixed in. “We add some for a little bit of extra fermentation,” Daoheung says. Right before baking, four-ounce portions of the dough are rolled into strands and formed into rings, then left to proof for another 20 minutes. After six minutes in the honey water, the bagels are removed and drained for “literally a second.” Then they’re seeded and put on 4x1 planks to go into the oven. The whole process has to happen quickly, Daoheung says. 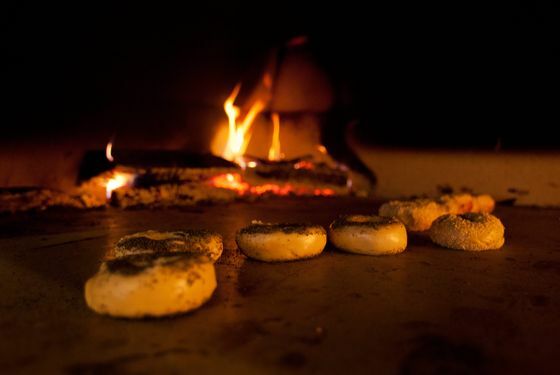 “If you let the dough sit too long, it will flatten out.” Nothing worse than a flat bagel. 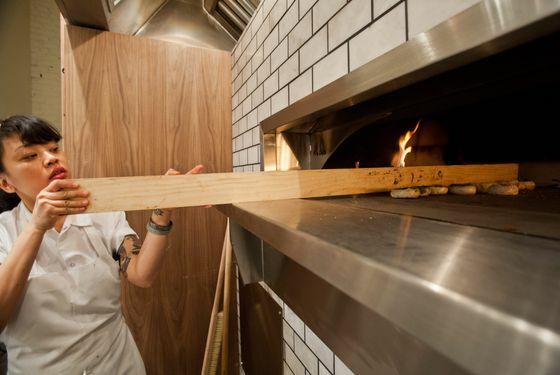 Into the gaping maw of the shop’s wood-fired oven, kept around 450˚ by the flaming hardwood. 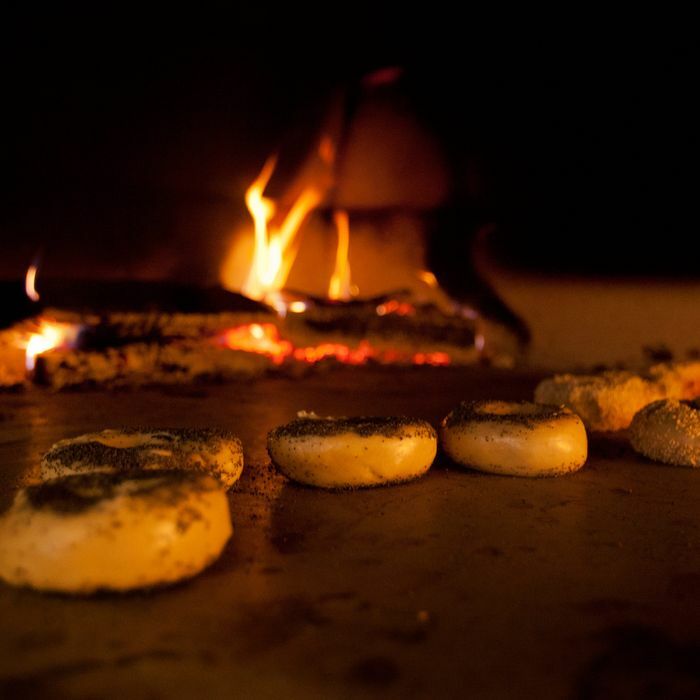 The bagels sit next to the fire for five minutes on the plank, then another five minutes directly on the hearth. 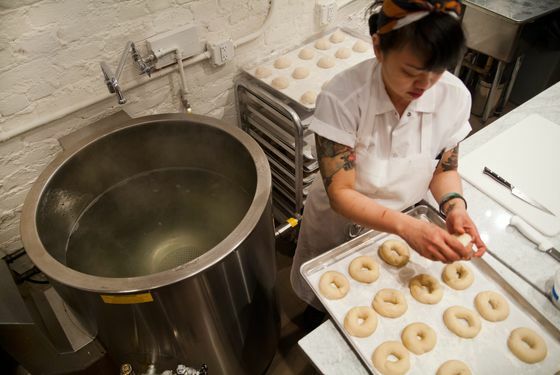 At most, the shop can only bake five dozen bagels at a time, which means it took a lot of time to make the 2,000 or so the shop went through on the first day. “We take them out, then that’s it. 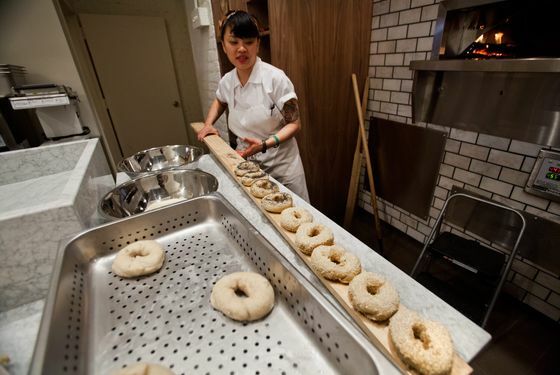 We put them in the little bagel chute,” Daoheung says. The last step is arguably the most important part: Fixings. Grub’s advice: Go for the homemade bluefish spread or the tobiko cream cheese.